(CNN) -- Two journalism groups have announced plans to honor a Sri Lankan reporter who was sentenced to 20 years in prison for articles that criticized the military. J.S. Tissainayagam was jailed for printing articles critical of Sri Lanka's military. A high court in the western Sri Lankan city of Colombo handed down the sentence to J.S. Tissainayagam on Monday, convicting him under the country's anti-terror laws. The editor of a monthly magazine, Tissainayagam was arrested in March 2008 for printing articles critical of the Sri Lankan military's treatment of civilians during the country's war on the Tamil Tiger rebel group. The Committee to Protect Journalists said it is honoring Tissainayagam to highlight "the depth of outrage at this unjust sentence." "Its harshness and the retroactive nature of the charges reflect vindictiveness and intolerance," the group said in a statement on Monday. It added that the reporter was in poor health and his confession was extracted under threat of torture. A second group, Reporters Without Borders, said it too will honor Tissainayagam with a newly-created award for journalists who display great courage in countries where press freedom is lacking. "The imposition of this extremely severe sentence on Tissainayagam suggests that some Sri Lanka judges confuse justice with revenge," the group said. After his arrest, the Tamil journalist was held without charge for several months, prompting outrage from human rights and press freedom organizations. He was later charged under the country's controversial Prevention of Terrorism Act. Tissainayagam, 45, wrote for the Colombo-based Sunday Times newspaper and edited OutreachSL, a Web site geared toward the country's Tamil population. 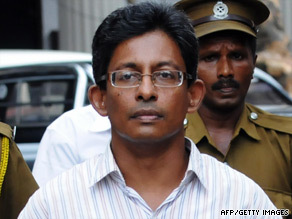 Prosecutors charged Tissainayagam with taking money from the Tamil Tiger rebels to fund the Web site. The site was, in fact, funded by a German aid project, Reporters Without Borders said. Tissainayagam's lawyer has said he will appeal. The case has drawn international attention to the plight of journalists in Sri Lanka, which ended its decades-long war against the Tamil rebels earlier this year. The country's military has been accused of numerous atrocities against civilians during the final months of the 26-year conflict. Sri Lanka has denied the accusations, and routinely rejects calls by human rights groups for independent investigations into its campaign against the Tigers.